The Fire Magic Outdoor Grill Vent Hood quickly exhausts excess smoke and heat from covered patios. From its efficient dual fans (1200 CFM total) to the configuration of the hood itself, the Grill Vent Hood is created specially for your outdoor grilling environment. Custom fitted to Fire Magic Grills and accessories, these rip stop fabric covers look great and are double stitched for durability. Light up your life and your grill with the new Aurora Grill Light. The halogen 10watt bulbs are identical to the built in lights on the Echelon Diamond Grill. Now on all Aurora Grills with backburner. This shelf simply snaps on and off no tools required. The shelf extender provides twice as much food prep space as the standard shelf. Griddle available for the Fire Magic double side burner as well as Echelon and Aurora grills. Cook eggs, bacon, and fluffy pancakes. Enjoy breakfast in the great outdoors! Also great for fajitas! Hard-anodized stick-resistant lined interior surface measures 14″ in diameter. The brass bristles on Fire Magic’s Grill Brush make clean up fast and easy. Includes one replacement brush head. Additional replacement brush heads also available. Includes a fork, spatula, knife and tongs. Constructed of quality stainless steel. Custom-designed for Fire Magic grills and sold in packs of 4, these convenient disposable drip tray liners reduce the risk of grease fires. Cooking with wood chunks or charcoal is easier than ever. Basket sits on top of the burner, gas burners ignite the chunks or coals. Bottom tray catches ashes for easy clean- up. Enjoy a golden, succulent chicken the quick and easy way! 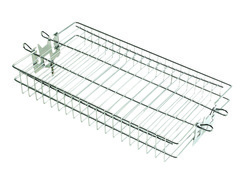 A versatile, stainless steel basket for skewers, burgers, ribs or fish. You’ll be amazed at how tender a deep-fried turkey can be. Kit includes pot, inner basket with sturdy handle and thermometer probe. Also great as a crab or corn pot. This sturdy holder is also perfect for beef, pork and lamb roasts. Protect your investment with the Fire Magic Stainless Steel Cleaner. Takes only a small amount to cut through grease and food build up. Removes most heat stains and rust spots. Can be attached to gas line for additional safety. Fire Magic’s 3 Hour, and new 1 Hour, Safety Timers offer additional safety and automatically shuts off gas flow at pre-set times. Easy to install. Great for apartment and condominium use. Constructed of stainless steel with a hands-free foot lever, the door easily slides open to reveal a 10.5 gallon trash can. Fully enclosed. Accepts and protects regular or jumbo rolls. Premium 304 stainless steel ensures a uniform look for all Fire Magic built-in products. Installed in a grill island counter top, this cleverly designed accessory lets you slice and dice on a Fire Magic bamboo cutting board, then sweep debris right into the Fire Magic trash receptacle or basic trash can via a deep stainless steel trash chute. Chute measures 14 3/4”. This durable and functional Bamboo Cutting Board is perfect for preparing meats and vegetables for grilling. 12”x 14”. Optional stainless steel LP tank shield for Patio Post Grill. Fire Magic’s Blender is the perfect companion for any outdoor kitchen, bar caddy or beverage center. The attractive and sturdy stainless steel cover protects the 675-watt motor from the elements.